Heat oven to 400°F. Place 4 (10-oz) custard cups upside down on ungreased cookie sheet; spray outsides of cups with cooking spray. Cut loaf of dough crosswise into 4 equal pieces. Press or roll each piece into 6-inch round. Place each round over custard cup on cookie sheet, shaping dough to fit around cup and form bowl shape. Dough should not touch cookie sheet. Bake 11 to 13 minutes or until golden brown. Place bread bowls with custard cups on cooling rack; cool 5 minutes. Remove bowls from cups. Meanwhile, in 2-quart saucepan, heat soup over medium heat until hot. Place bread bowls in shallow soup bowls or pasta plates. Ladle soup into bread bowls; serve immediately. Don’t have enough 10-oz custard cups? Lightly crush 4 sheets of foil into 4 (4-inch) balls; flatten tops slightly. Place flat sides up on ungreased cookie sheet. Continue as directed above. Remove foil from bread bowls and discard. You don’t even have to leave the house to enjoy bread bowl soup anymore, thanks to this creative recipe. Even better, you’re not limited to the restaurant’s soup of the day! 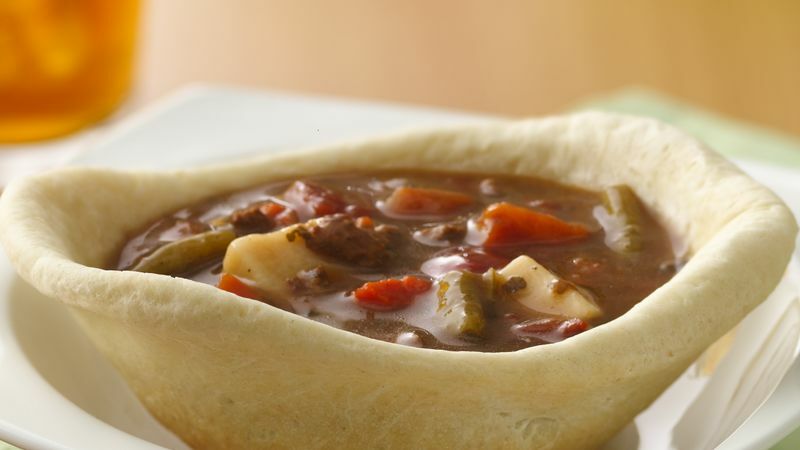 By making your own bread bowls at home, you can whip up any soup you want and enjoy it in a homemade bread bowl. If you’re in a hurry, ready-to-eat Progresso™ soups (like this recipe suggests) are a great option. But if you have a little more time, try making your chili, corn chowder or French onion soup from scratch! And once you’ve tried those, give these other soup recipes a try, too. Making a bread bowl is already pretty next level, but you can make your soup even more restaurant-worthy with fun topping combinations and sides. Find all of the ways you can take you can take your soup up a notch here.